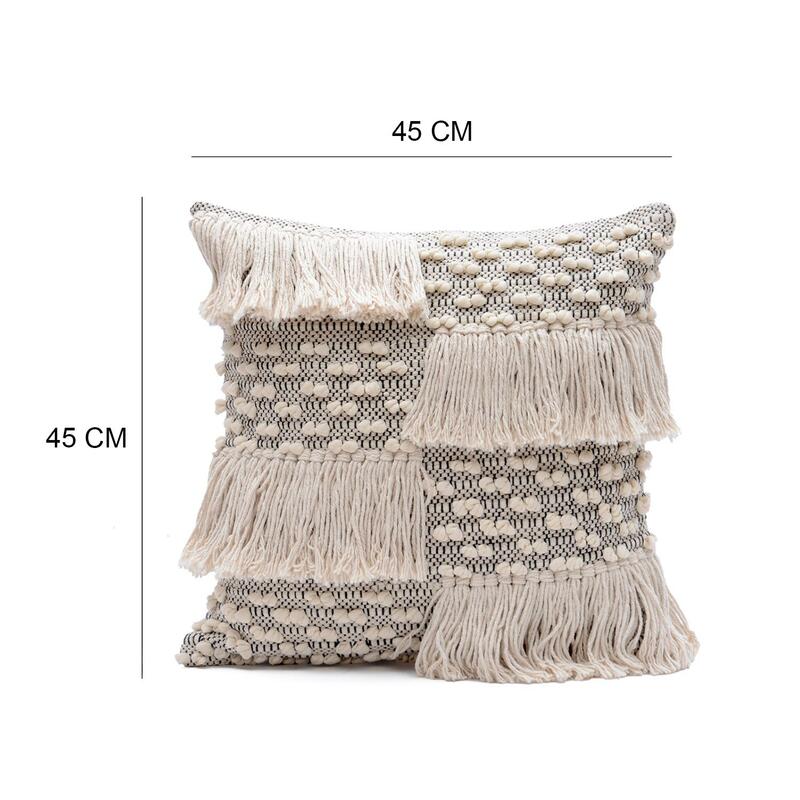 Boho Woven Shaggy Cotton Cushion Cover Size: 18" x 18"
This cushion cover will bring a touch of style and texture to your boho or contemporary style decor. 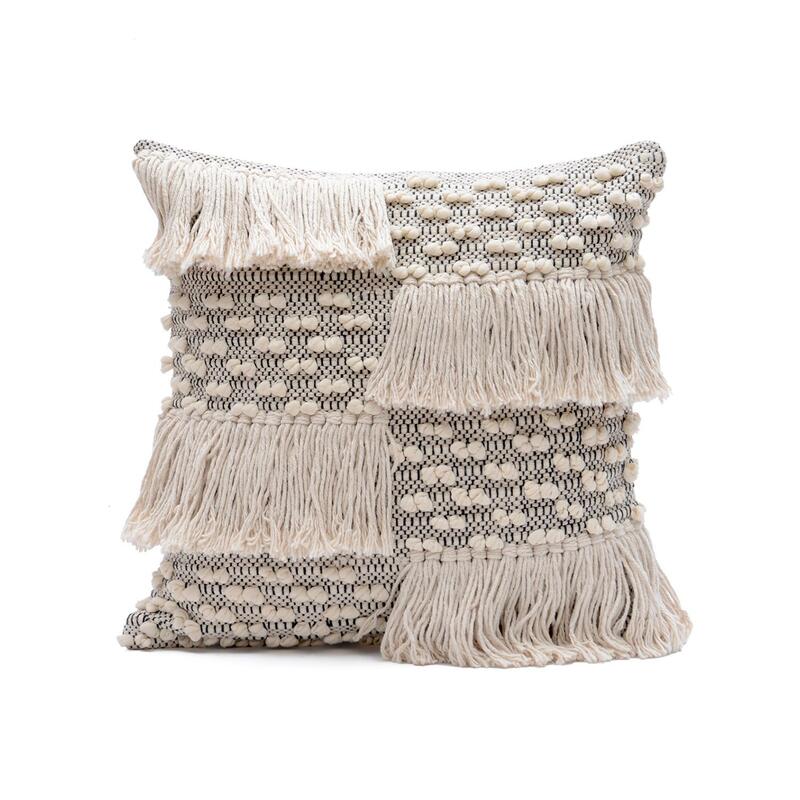 In a sophisticated palette, this cushion cover features a woven design and fringe decorative rows. This fabulously crafted cushion cover is a smart and comfortable furnishing for your bed, sofa or settee. 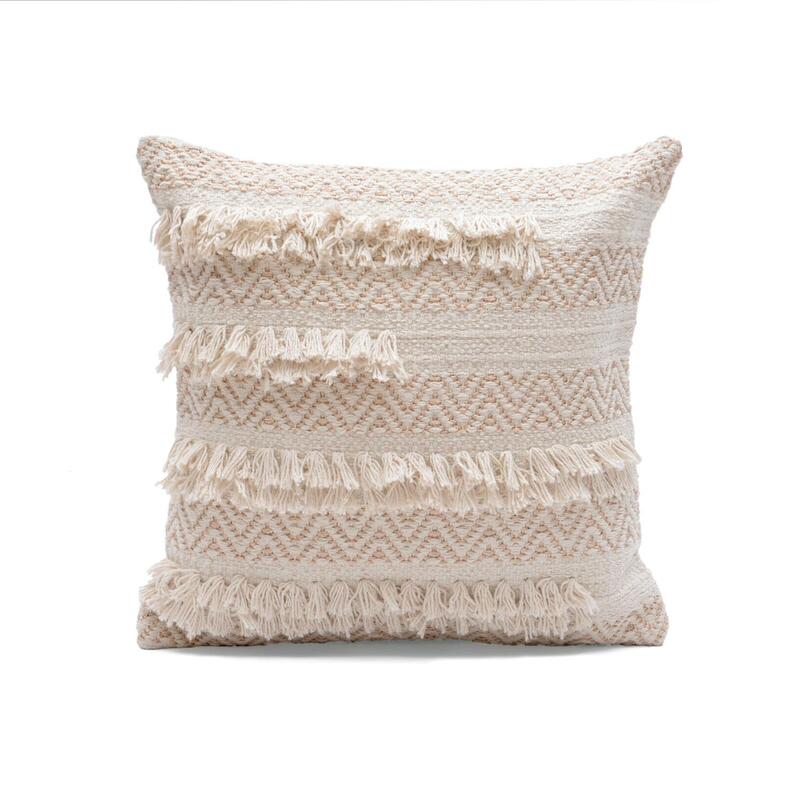 Boho Woven Shaggy Cushion Cover Size: 18" x 18"
Made from cotton, this cushion cover display a decorative woven pattern with shaggy detailing. Its subtle colour scheme reflect a hint of classic elegance. This decorative cushion cover will make a sophisticated addition to a bed, sofa or armchair. 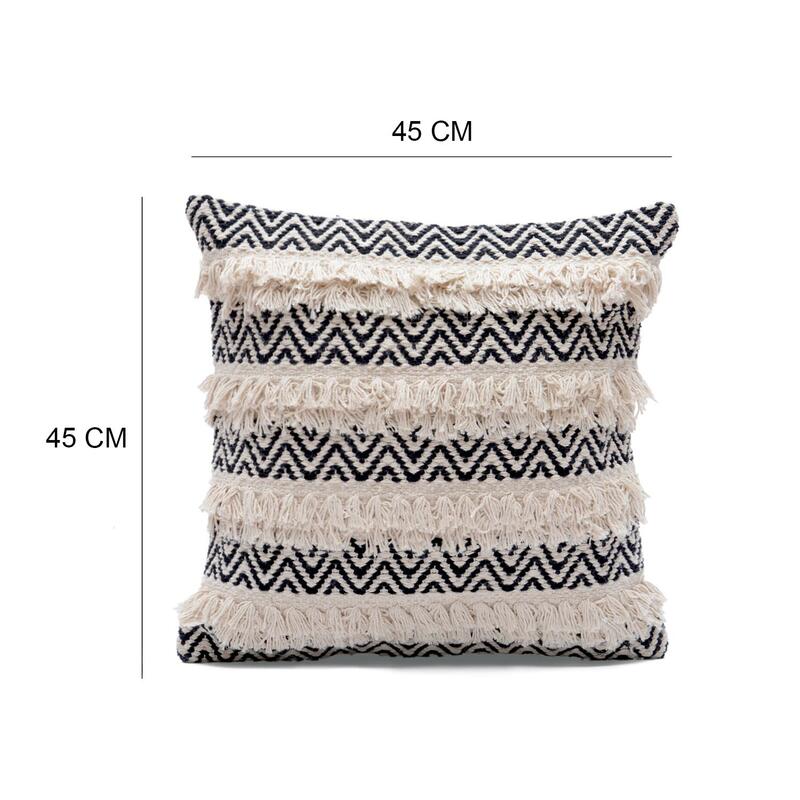 Chevron Shaggy Cushion Cover Size: 18" x 18"
Woven from 100% cotton, this square cushion cover has a soft, plush feel that will enhance the comfort and cosiness of your living space. The bold pattern on the cushion cover features chevrons detailed with shaggy in an understated and natural colour palette of cream and black. 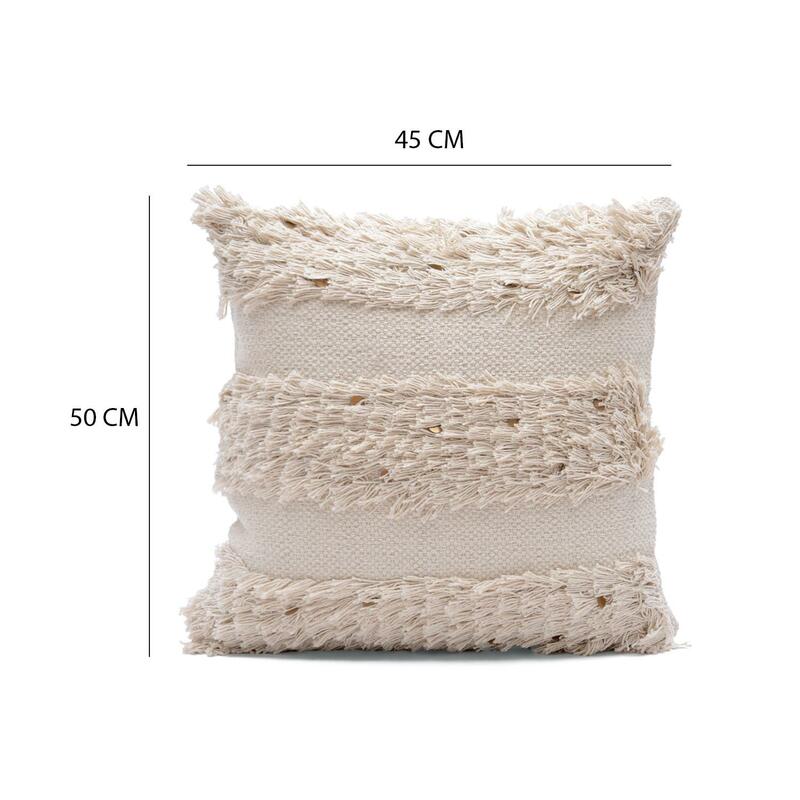 Cotton Shaggy Textured Cushion Cover Size: 20" x 20"
The unique design and soft, subtle shade of this decorative cushion cover adds a cosy, comfortable feel to the living room or bedroom. 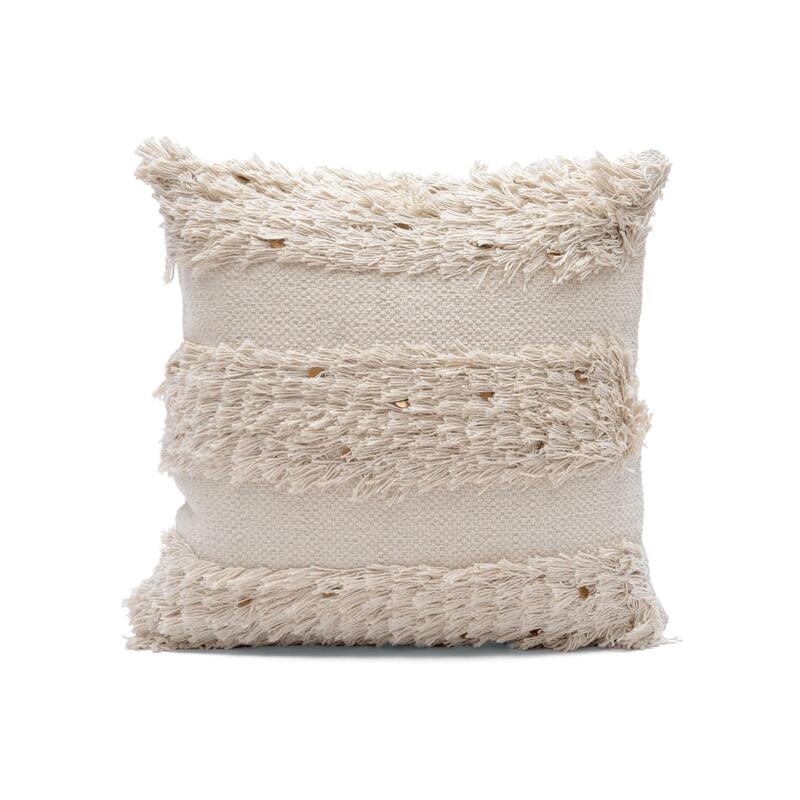 This beautifully designed cotton shaggy cushion cover is a decorative addition to your living space. 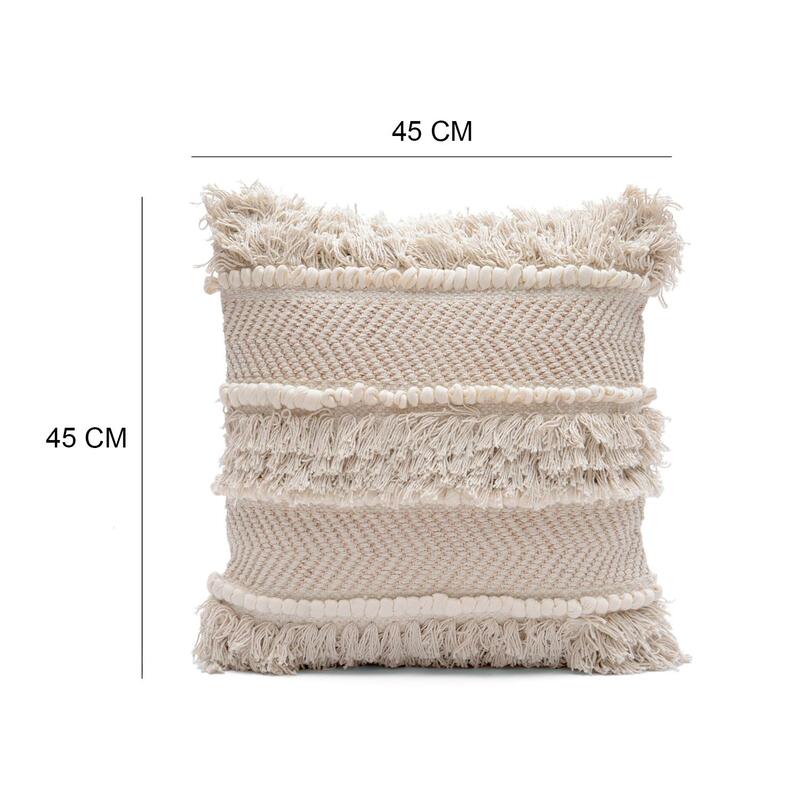 Cotton Woven Shaggy Textured Cushion CoverSize: 18" x 18"
With this decorative cushion cover, you can give a finishing touch to your home décor and brings more detail to your home! 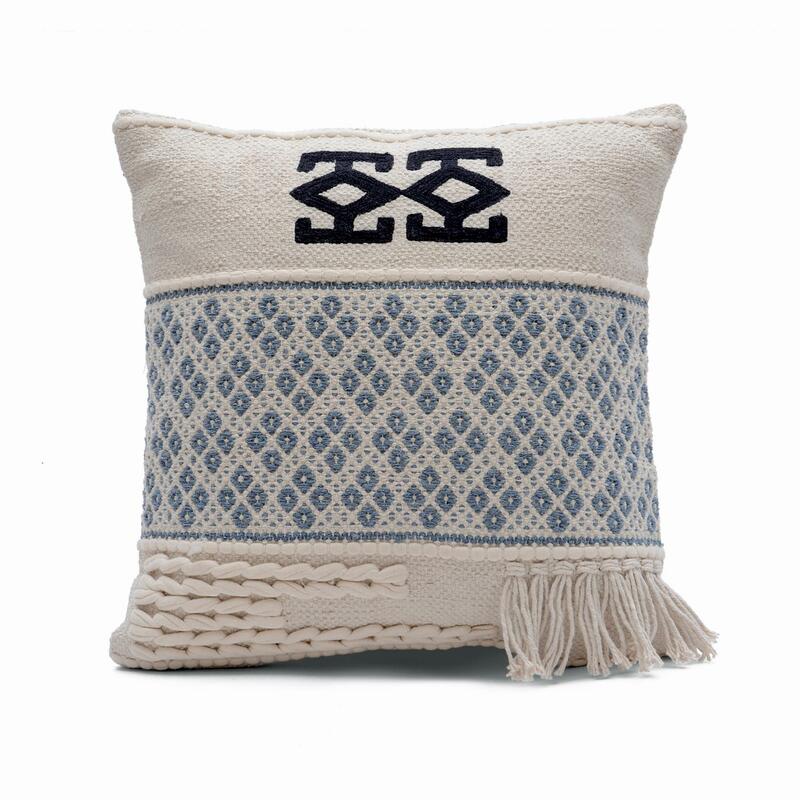 Showcasing a simple yet eye-catching pattern, this soft cushion cover makes any bed or couch a cozy and delightful place to relax. 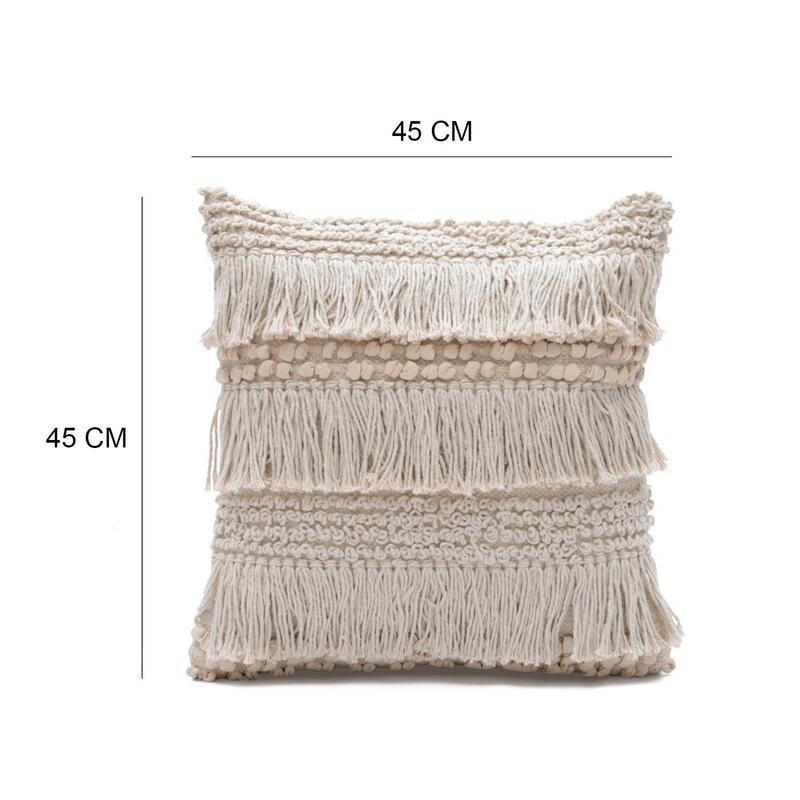 Decorative Boho Shaggy Cushion Cover Size: 18" x 18"
This cushion cover will make a fantastic addition to a contemporary interior, bringing with it a touch of warmth and boho charm. 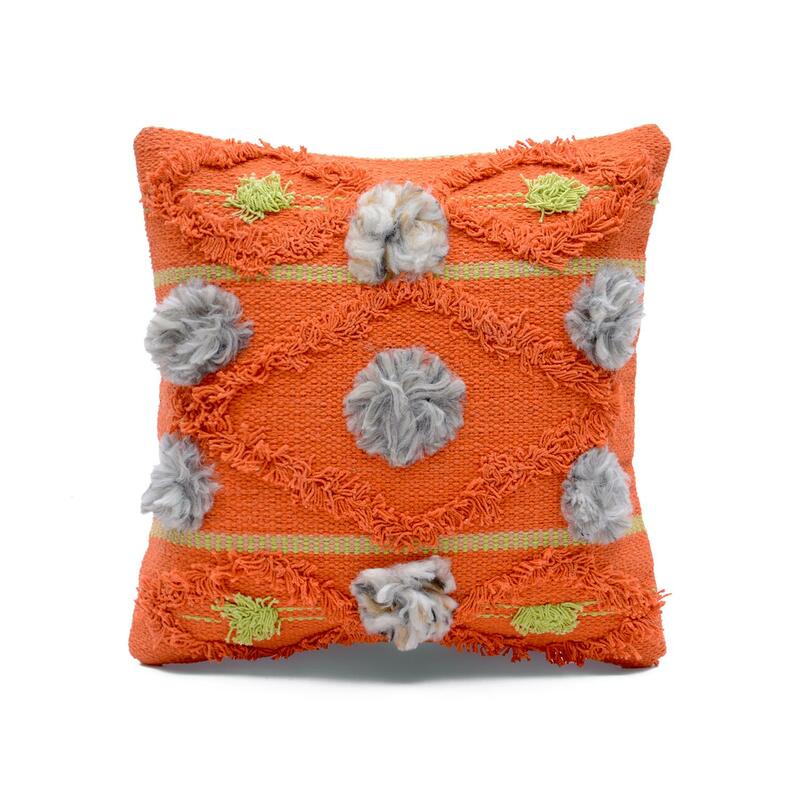 Used to adorn a sofa or bed, this handcrafted cushion cover lends a bohemian look to a lounge or bedroom. 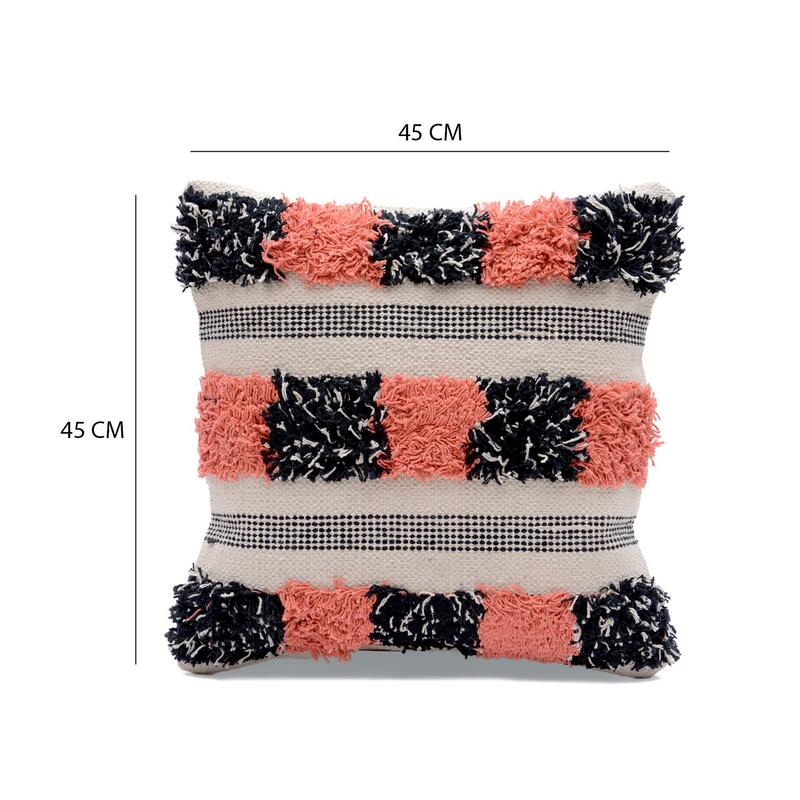 Decorative Coral and Black Shaggy Cushion Cover Size: 18" x 18"
Given unique style to your interiors with this cushion cover. 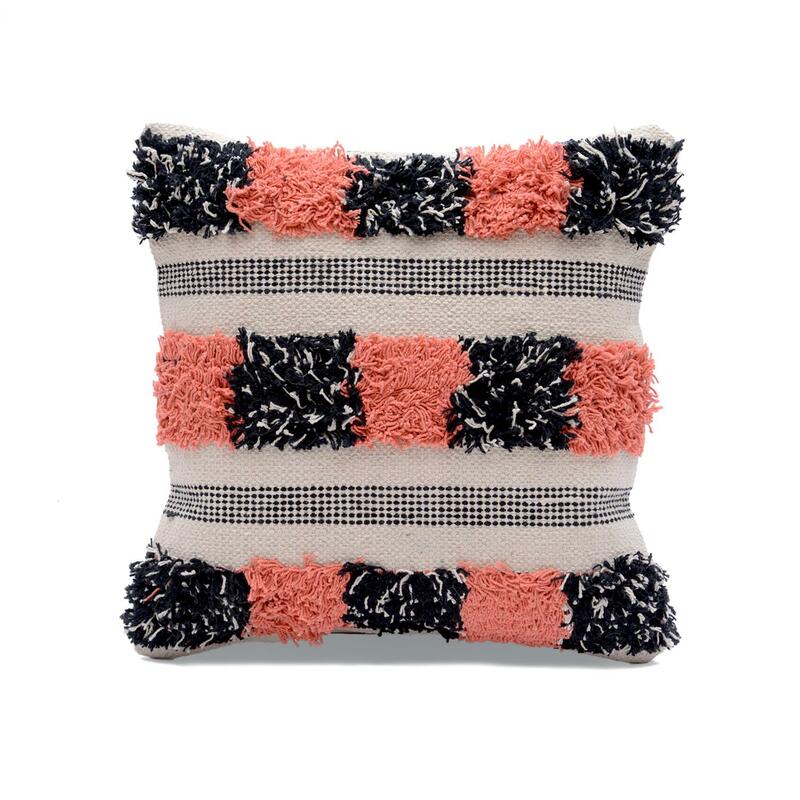 With coral and black shaggy accent and woven texture, this cushion cover is ideal for both the bedroom as well as the living room. This beautiful piece can also be used as a gift for your dear ones. 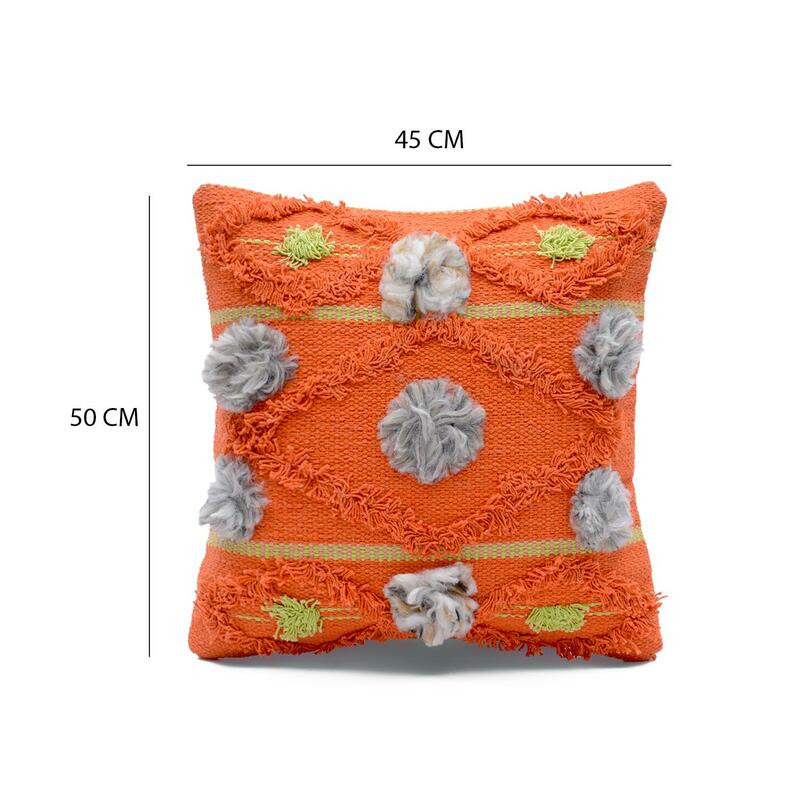 Designer Shaggy Textured Cushion Cover Size: 18" x 18"
Give your room the bright color and shaggy texture with this decorative cushion cover. 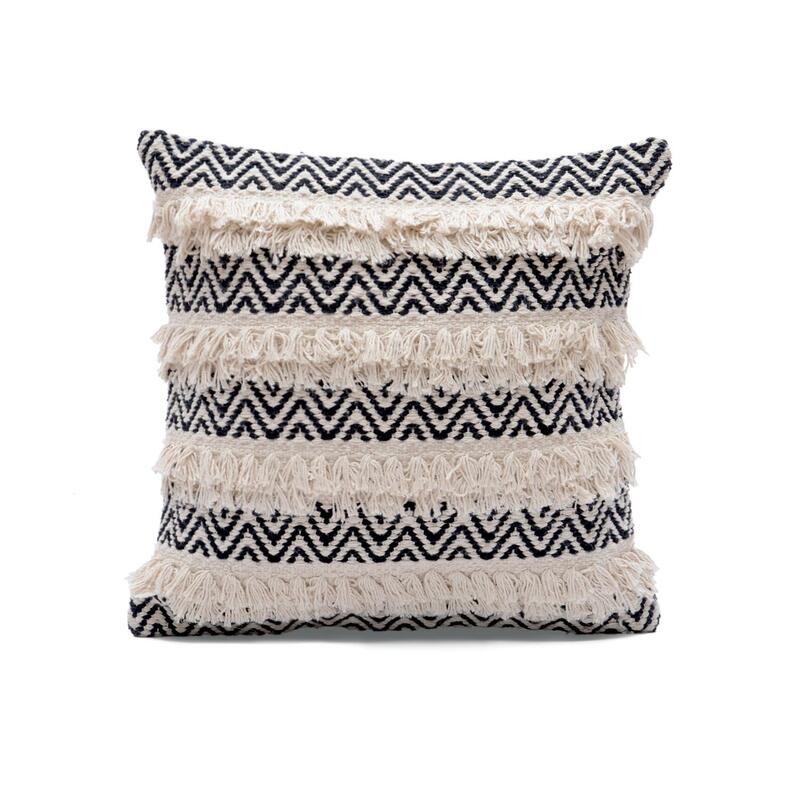 Soft and stylish, this cushion cover is made from 100% cotton. 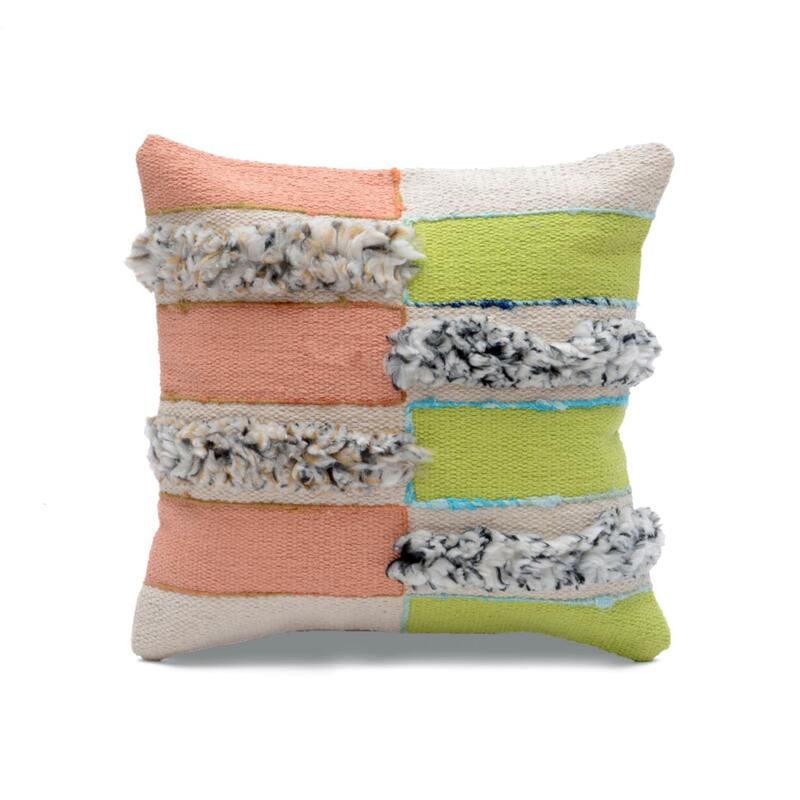 This cushion cover creates a dynamic look that’s sure to add a pop of colour to your space. 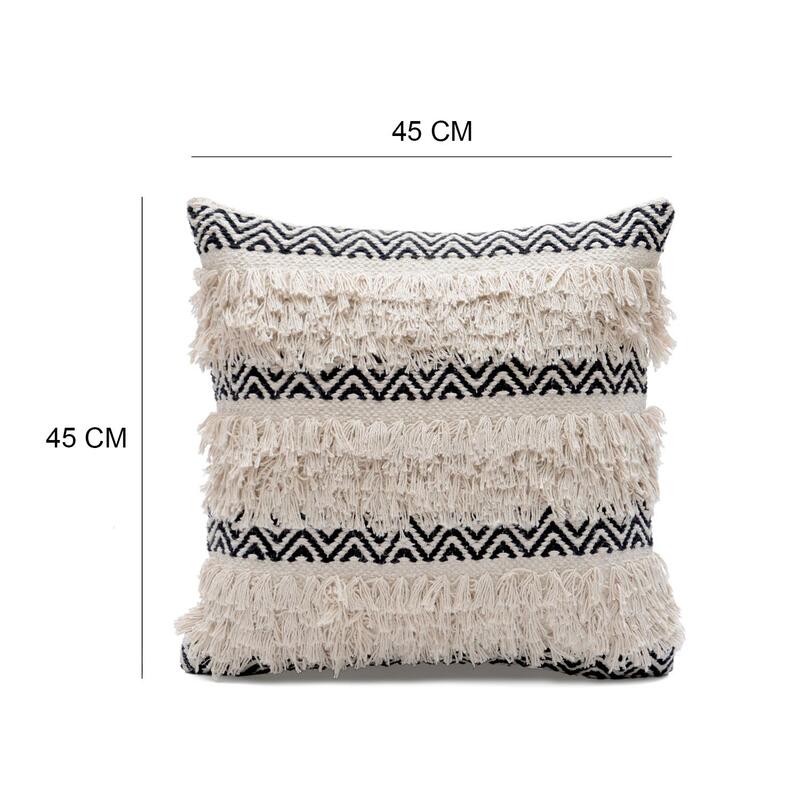 Designer Woven Shaggy Cushion Cover Size: 18" x 18"
Make a statement to any space with this woven cushion cover. 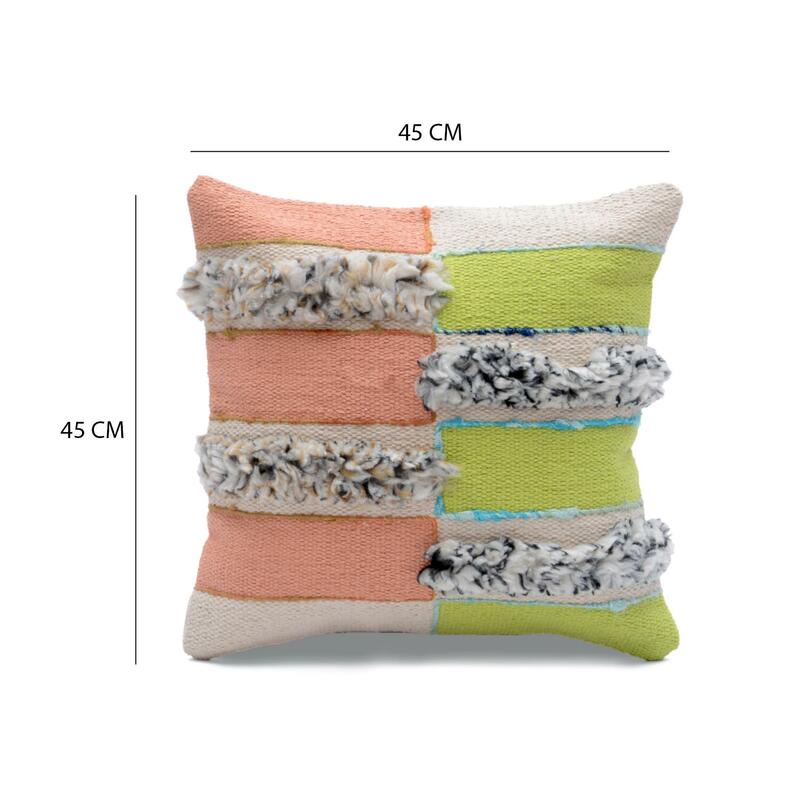 This multicolored cushion cover is perfect for sofas or beds, combining both comfort and great design. This decorative cushion cover is a must have in any space. 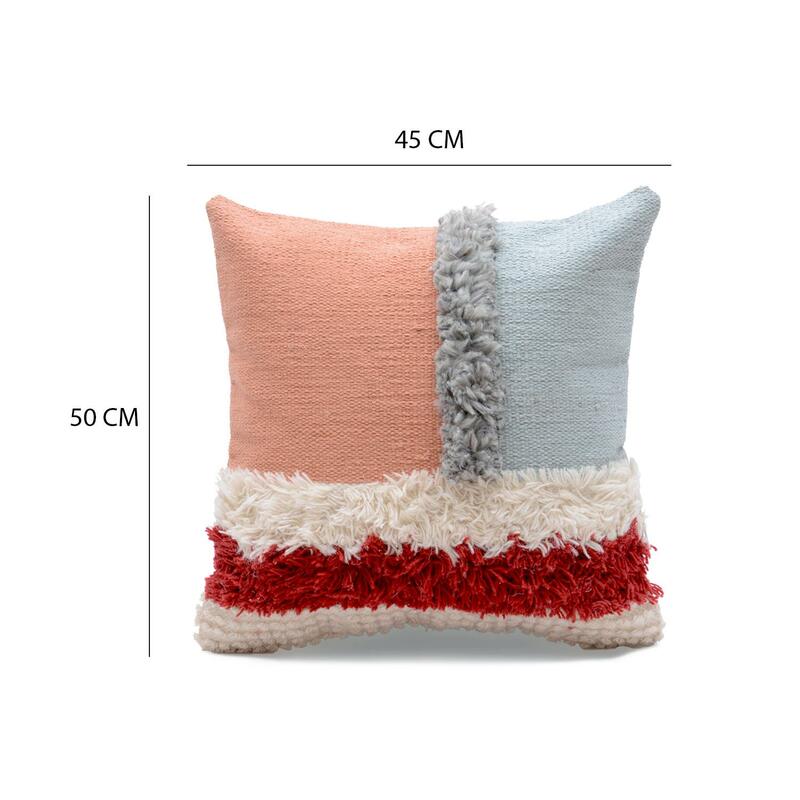 Modern Shaggy Cushion Cover Size: 18" x 18"
This beautiful and colourful cushion cover is an instant eye-catcher. 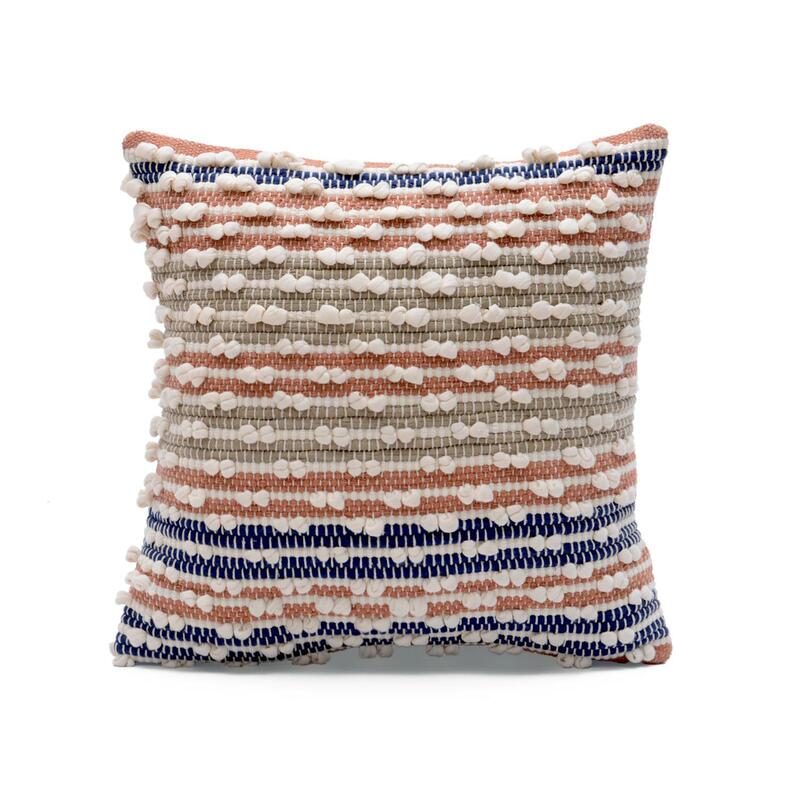 The woven texture, modern colors and shaggy detailing lend this cushion cover a vibrant feel. 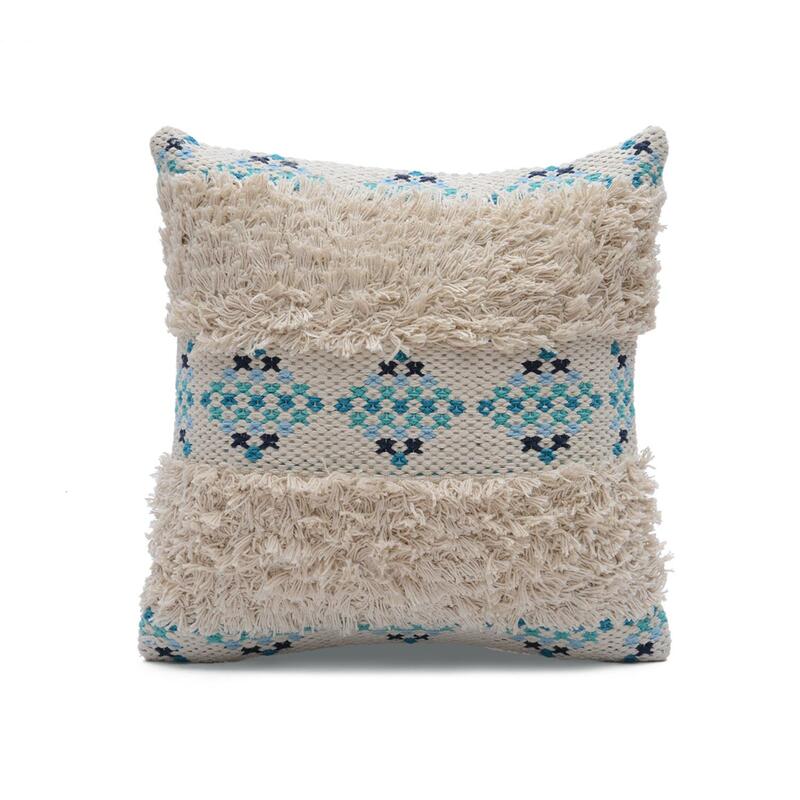 Made with 100% cotton, this gorgeous cushion cover is the perfect into your home. 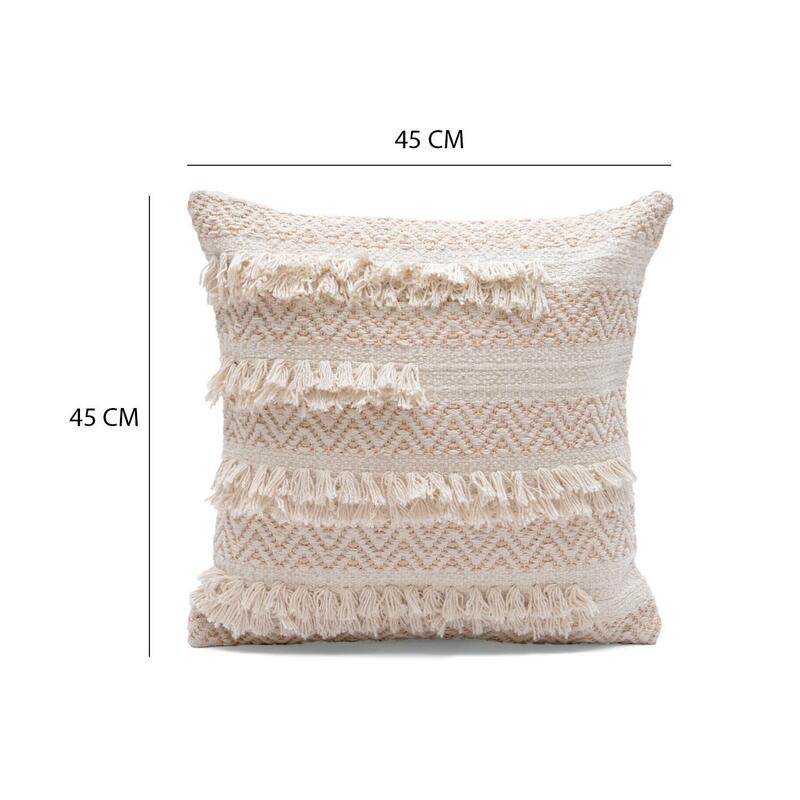 Modern Woven Shag Cushion Cover Size: 18" x 18"
Revive your bedroom and living room with this attractive cushion cover which will complement your decor style. 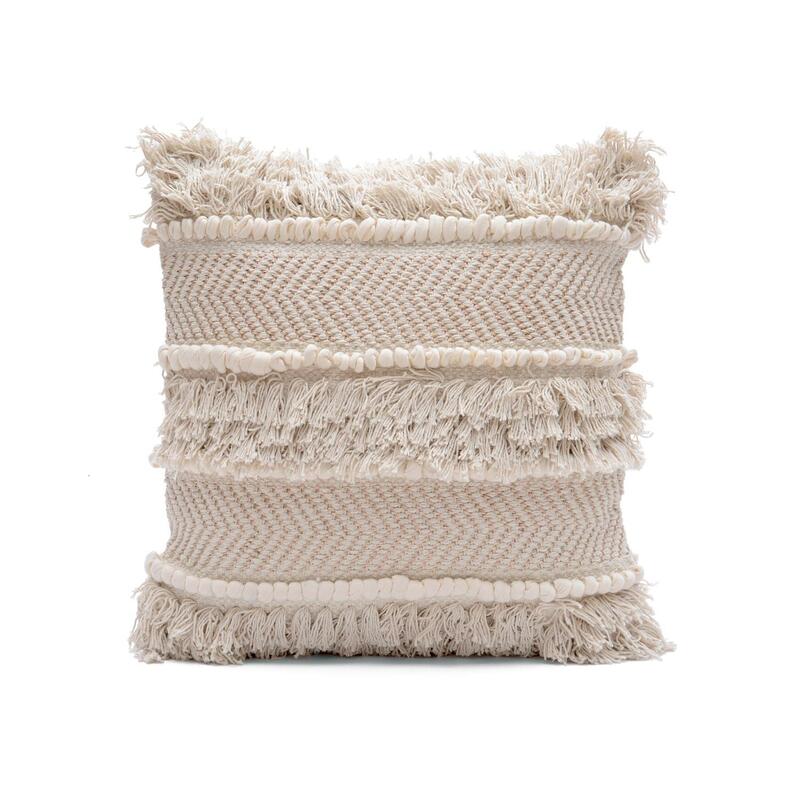 Featuring woven texture, shaggy detailing and classy colors, this cotton cushion cover is an alluring piece for your home furnishing. 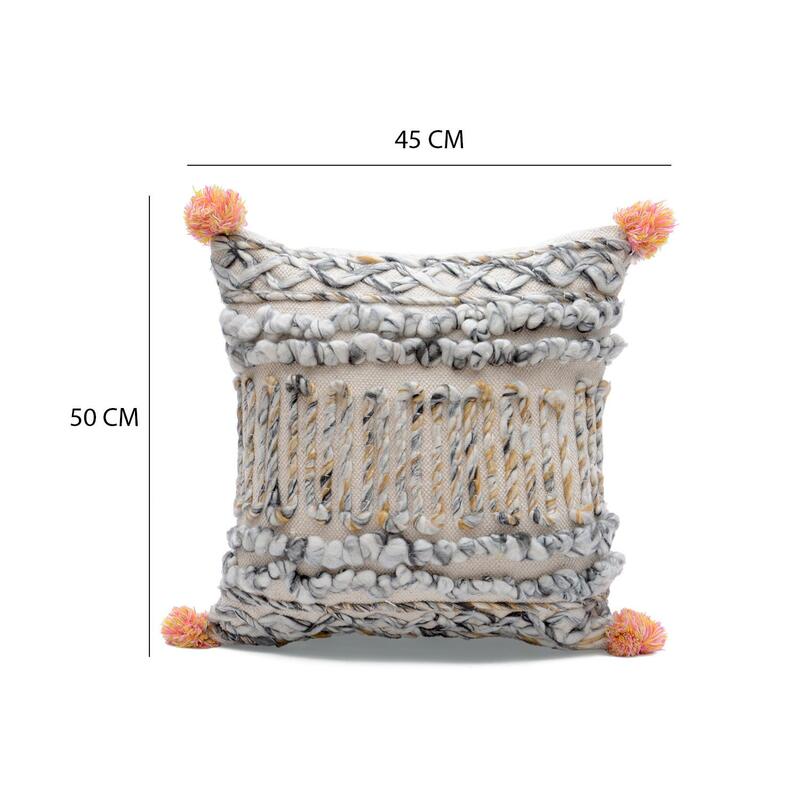 Neutral Woven Shaggy Cushion Cover Size: 18" x 18"
This decorative cushion cover showcases woven intricate pattern and shaggy detailing in warm shades that bring an inviting look to your décor. 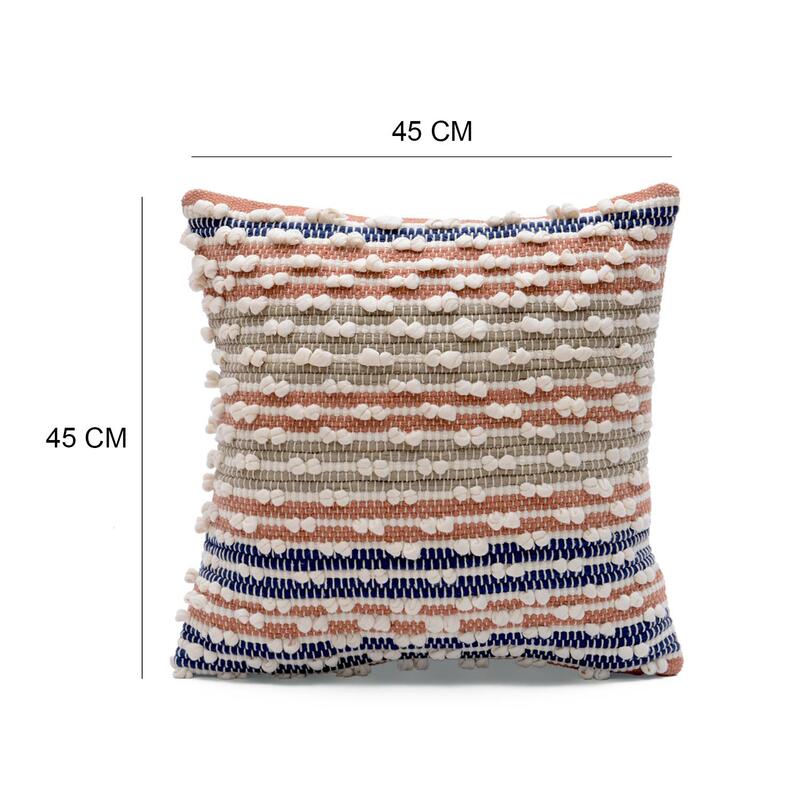 This handcrafted cushion cover has a cottony feel that elevates the comfort of your sofa, chair, or daybed. 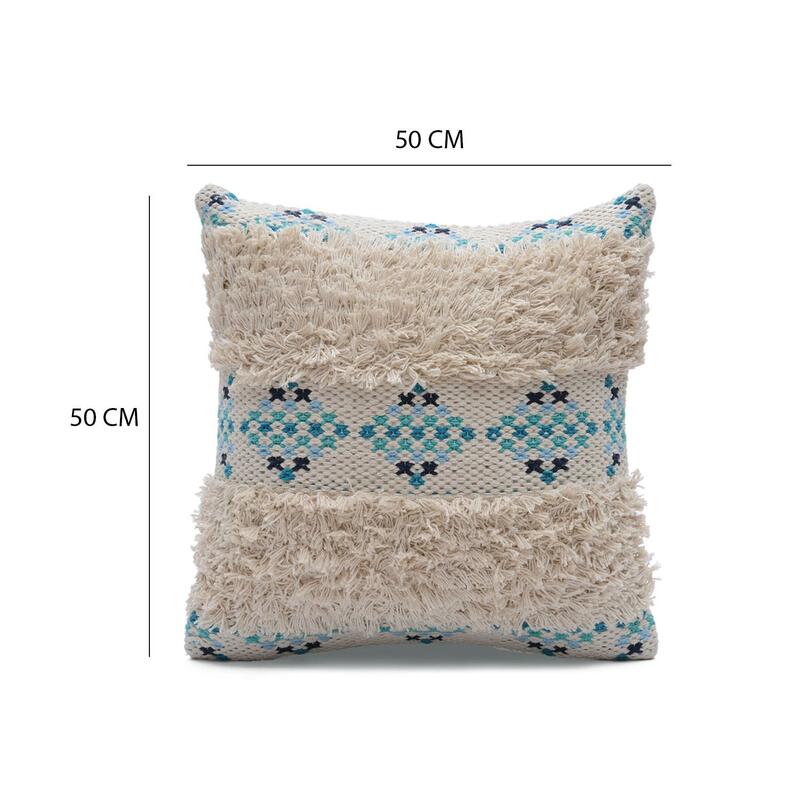 Pom Pom Shaggy Accent Cushion Cover Size: 18" x 18"
This decorative cushion cover features an adorable woven design and pom pom attachment on all corners, making it easy to mix in with existing decor. 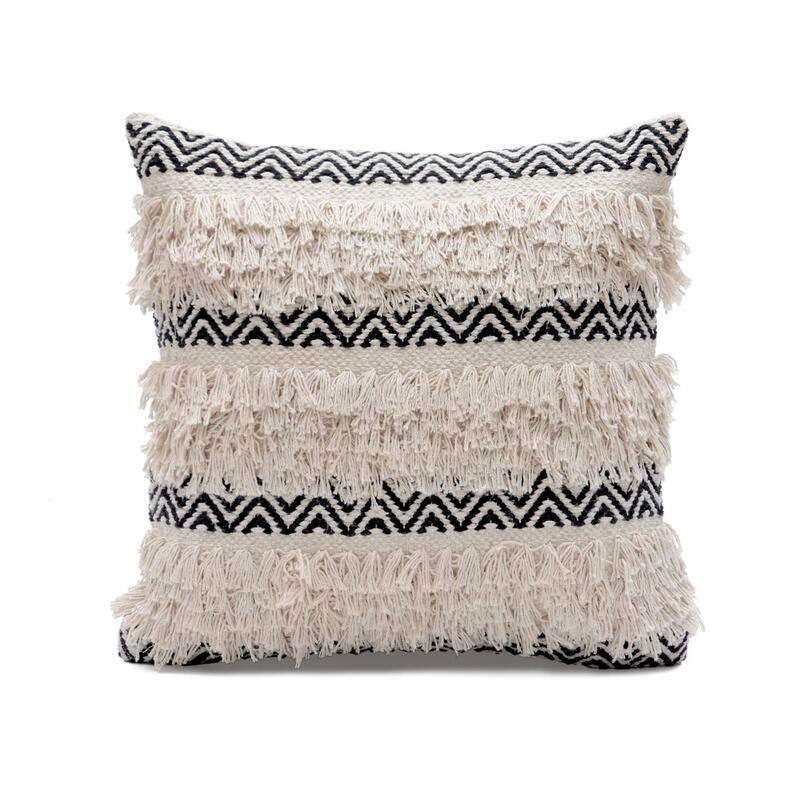 This boho cushion cover adds both comfort and artful appeal to your ensemble. 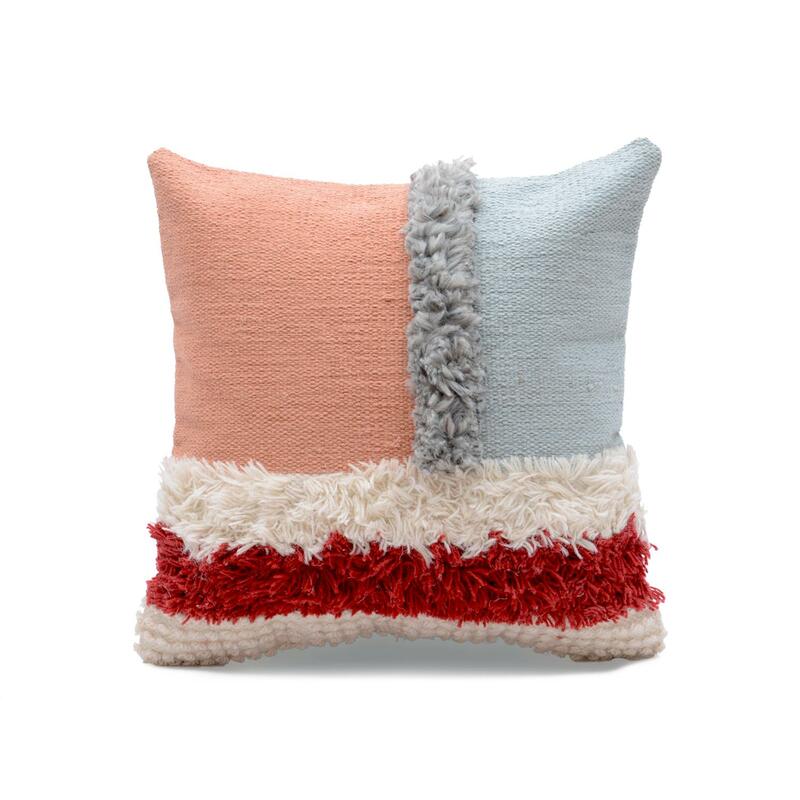 Pom Pom Shaggy Cushion Cover Size: 18" x 18"
Give your living space a boost with this elegant and playful cushion cover features bright colors, shaggy accent diamond pattern and pom pom embellishment. Made from 100% cotton, this beautiful cushion cover will add another dimension to your living space. 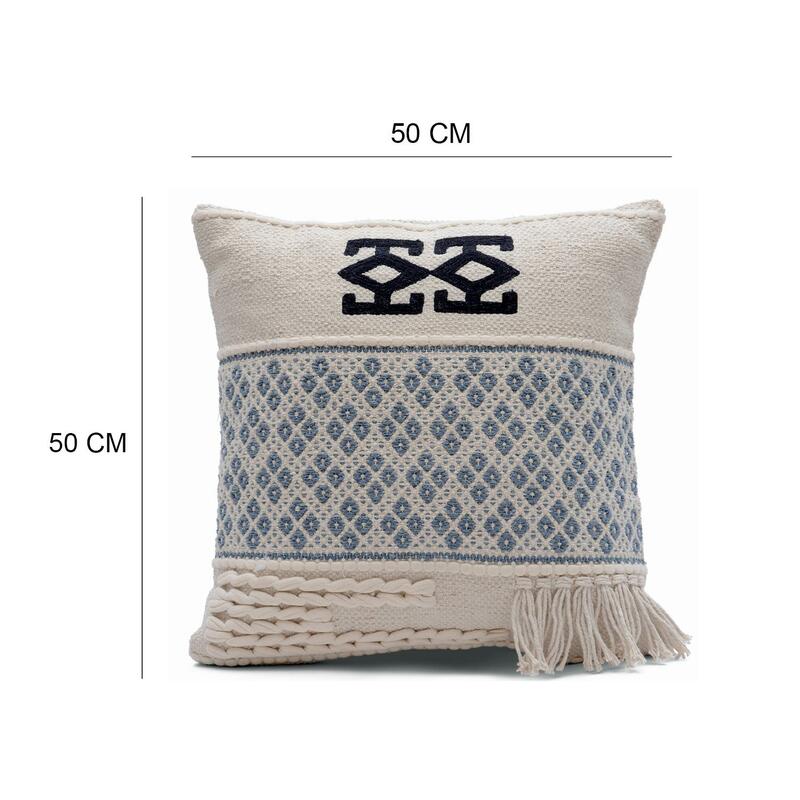 Shaggy Hand Woven White Cushion Cover Size: 18" x 18"
This timeless classic cushion cover is a must-have for any sofa or armchair. 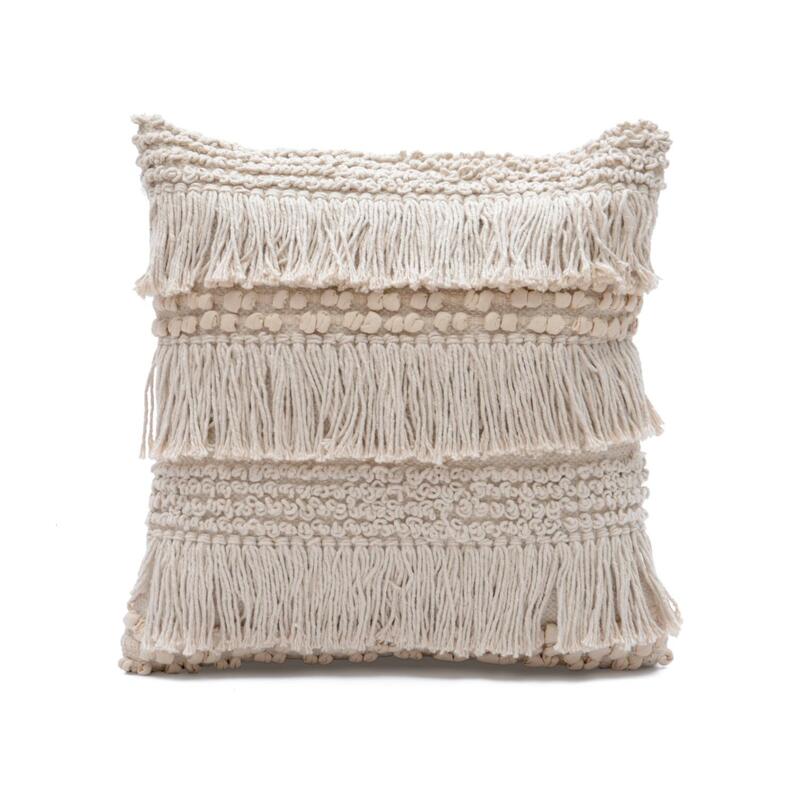 Its neutral colour and shaggy detail adds insta-luxe to any decor setting. 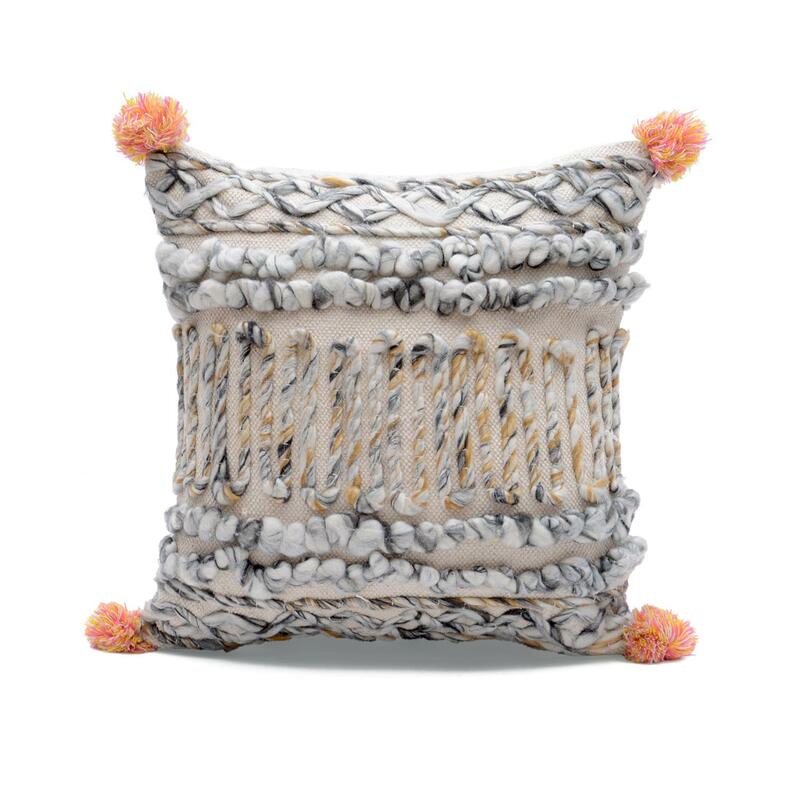 This decorative cushion cover will add an instant elegant touch to any seating.